Home Blog Posts Is Composite Decking Worth The Cost? Paper or Plastic? 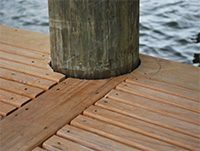 Should I use composite decking on my dock? 1. Framing Requirements. Most composite decking requires different framing requirements. The cost of framing can increase the overall project cost by 30% alone since most composite requires more framing boards per foot due to the increase flex of the decking material. Costs also increase due to the smaller room for errors in construction. One mistake with wood might cost a dollar or two. Mistakes with composite likely run much more. 2. Labor Techniques. In addition to the increase framing (more boards = more labor), preferred and/or required techniques such as pre-drilling, hidden or special fasteners can increase the cost by 10% or more. 3. Fasteners. Many composites require special fastening systems such as hidden clips, self-tapping screws, counter-sinking screws are costly by themselves. Add to that the fact that up to 30% more fasteners are required and the cost adds up quickly. 4. Trim. Most composite boards leave a sharp edge when cut. This necessitates trim boards to cover those edges. Again, an increase in labor and materials cost. 5. Future Repairs. Factors such future material availability, color fading and storm damage should be considered. Many composite vendors are no longer in business so no replacement material is available when repair time comes. Even if the decision is made to go with a composite deck, make sure you’re prepared to absorb the replacement cost when the storms come. With all that said, composite decking material can be a beautiful alternative to traditional wood decking. It does last longer (exclusive of storms), can be stronger and may be easier to maintain. If you’re prepared to spend 2-3 times the money for composite decking, you will likely be satisfied with the decision.